In UX design, make data-driven decisions, not decisions based on gut feelings. There’s no such thing as an airtight blueprint for the perfect user experience. Sure, you can rely on the best practices found in numerous guides on the web. But at the end of the day, to establish the baseline of great user experience — you still need to test, measure, and constantly improve. For UX designers, marketers, and website owners, using a web analytics tool like Google Analytics to track bounce rate, traffic, and pages viewed per session is important. Robust analytics solutions also enable the monitoring of user interactions performed on a website. This allows brands to determine which on-page elements are successful in generating user engagement and which aren’t. It’s an overall effective approach if you want to start making the right calls in your UX design process — albeit a time-consuming, tedious one. What if I told you that there’s a way to skip all the number crunching and get right to the actionable insights? Here’s the thing: If there’s one source you can trust for potential improvements to your website, it’s none other than your own user base. After all, they’re the ones you’re building experience for — not the numbers you find on Google Analytics or whatever tool you have on your belt. The key here is to automate the feedback generation and acquisition processes. This way, you only need to worry about analyzing the data and converting them into action plans. Curious how this works? Then let’s get down to the steps of automating feedback generation. When collecting feedback, you can’t ignore the customers who’ve already been through your website and made a purchase. Clearly, something about your design worked in closing a sale. And if there are certain aspects that your customers disliked, then a review request email will help you identify them. 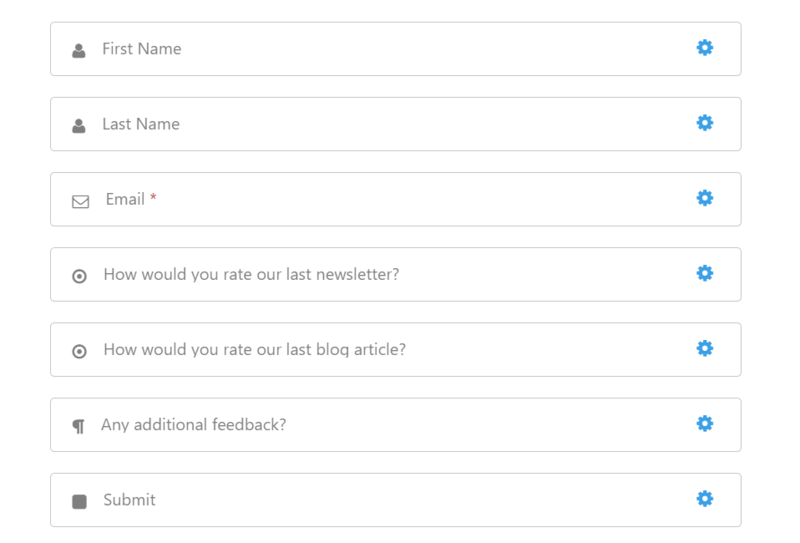 This is perhaps the easiest way to use automation for the solicitation of user feedback. Even a free email marketing tool with basic automation features should be enough. MailChimp, for example, has a ready-made automation template you can use to get the job done. 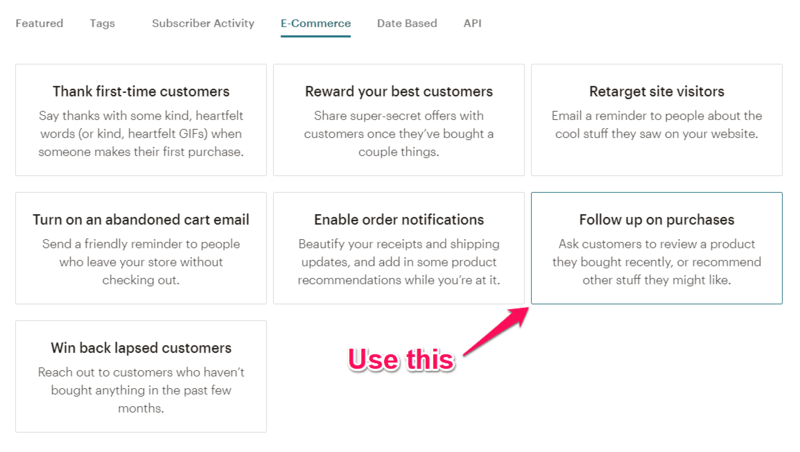 Just choose “Follow up on purchases” when creating a new automated email workflow. Insert links to specific review sites. Whether you want reviews posted on Google, Facebook, or your own website, don’t forget to include a link to the actual review form for the customer’s convenience. Better yet, embed the form itself into the email. 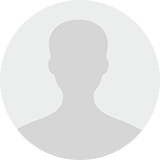 Test multiple email templates. Since there’s never a one-size-fits-all solution to anything, remember to run A/B testing with multiple email templates and decide the best one based on results. 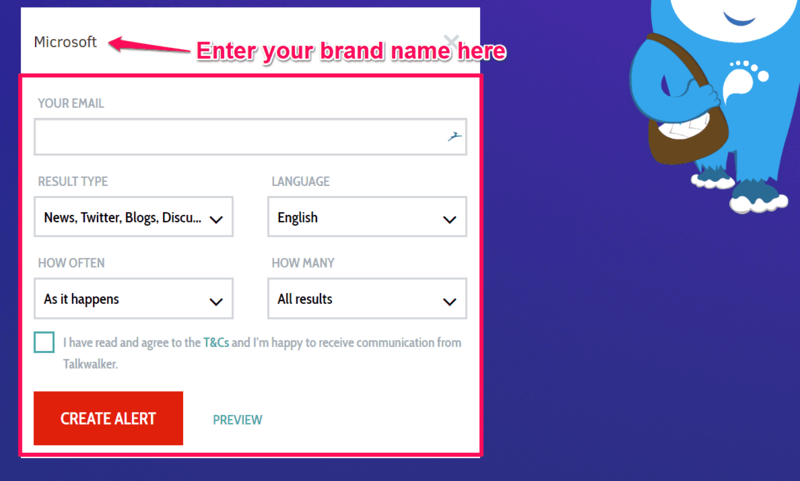 Just be sure to personalize these templates to make customers feel more valued. From a UX standpoint, plugging the word “pop-up” into anything makes it sound like a bad idea. Understandably, you want your audience to focus on your core messaging. How can they appreciate the genius behind your business idea and value propositions if there’s an element programmed to distract them? That’s why well-timed is the keyword if you want to use pop-ups to present your review request. Instead of kicking off the experience with a full-screen pop-up, configure your request to appear only at certain points in the user journey. 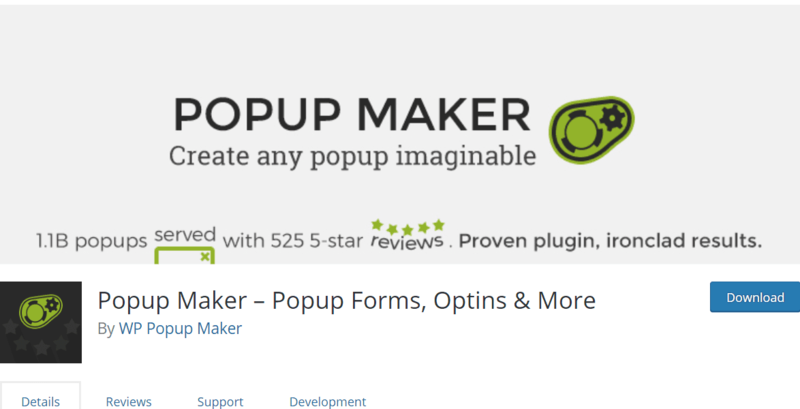 For example, if you use WordPress, you can easily use a plugin like Popup Maker to create pop-ups with special triggers. Popup Maker works incredibly well when paired with a form builder like Ninja Forms. Why? Because it allows you to quickly build a review request form and embed it into your pop-up via shortcode. Put simply, Ninja Forms is a visual form builder that makes it possible to create advanced forms without a single line of code. To make everything even easier, it comes with a pre-made feedback template. If you want, you can also install an extension that enables Popup Maker to create exit-intent pop-ups. This is ideal if you want to figure out why the user chooses to abandon your page. Finally, people could already be talking about their experience with your brand on social media — you just need the right tool, one that monitors for brand mentions. Talkwalker Alerts, for example, lets you listen for brand mentions on Twitter as well as on blogs, online discussions, and the news. Although this doesn’t always guarantee any constructive feedback from users, Talkwalker Alerts lets you tune in to the overall sentiment of the social media community on your brand — especially since Twitter is this generation’s go-to platform for opinions. For those of you looking for more sophisticated approaches, read our article on sentiment analysis using Machine Learning. No matter how amazing your follow-up emails, your services, or the support you’re offering are, the chances are good that some of the people in your email list will still unsubscribe from your newsletters. Don’t let it get to you. No, really! After all, people have everchanging needs. Also, the possible reasons why these people subscribed to your email list are endless. Perhaps some of them are/were indeed interested in your services. Perhaps others are just trying to “warm-up” their email for their outreach campaigns. Others could also just be trying to build a relationship with you to close you as their client, etc. All that said, it still wouldn’t be wise for you to just allow them to unsubscribe without trying to obtain data (or feedback) on why they decided to bolt. Instead of just leaving them alone when they unsubscribe, why not ask them for their feedback? When you have an automated message like this in place for the people who unsubscribe to your newsletters, you’ll be able to obtain valuable insights from them about their reason for leaving. Do not make it compulsory for your users to type in lengthy feedback. Give them options to choose from instead. You can also ask them about the things they liked (or do not like) about your company. 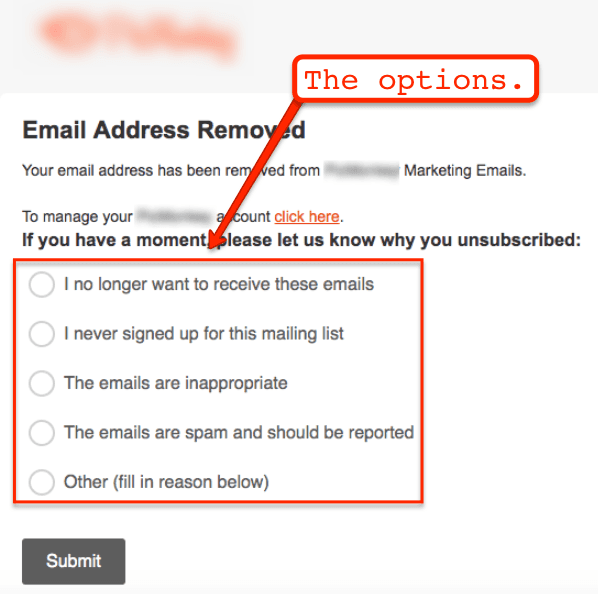 Most companies only ask about their users’ reason for unsubscribing when they could ask for more. Remember, the input from the people unsubscribing from your newsletters can become a goldmine of data for your business. The feedback that these people often give is truthful — some of them come from a place of dissatisfaction and frustration. It’s because of this that you need to heed their words, carefully considering how you can make appropriate adjustments to improve your business. 5. Set up your Response Assistant on Facebook. If you’re like most people, then you’ve most likely contacted a company through their Facebook page. My question is, did you get an automated reply from them when you hit the “Send” button? If not, then the company’s missing out on a lot of opportunities to learn more from you. Just by going to your Facebook Response Assistant, you can tweak the automated reply Facebook sends to the people who message you through Facebook’s Instant Messenger. At this point, just replace the automated message with something that welcomes your audiences’ feedback. Hi (Name)! Thanks for getting in touch with us on Messenger. Please send us any questions you may have. Hi (Name)! Thank you for getting in touch. Please send us any feedback or questions you may have about (Brand Name). A quick reminder though. Facebook limits the message to 160 characters. So keep that in mind when thinking about how you’ll personalize your message. Being able to automate how you generate user feedback can do wonders for your business. There are many tried-and-tested business ideas to make money on the internet. No matter which one you choose, you will find that integrating user feedback can help you not just with increasing your sales, but also with content generation and solidifying your brand image as an authority in your industry, to name just a few benefits. By using the five methods above, you automate your process of generating user feedback, while simultaneously automating success patterns that can help grow your business to greater heights. What are the strategies you’re using to automatically generate user feedback? If there are strategies, questions, or ideas that you’d like to share with the community, please do so in the comments section below. Cheers! 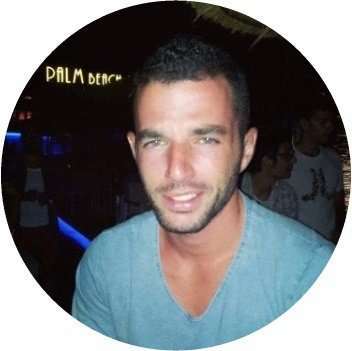 Afik Rechler is Inbound Junction’s VP of Business Development. He is passionate about helping companies streamline their business process.